This cute pink plastic tablecloth sets the foundation for a sweet baby shower! 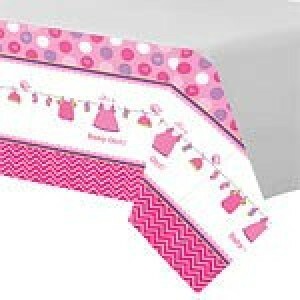 Our 'Baby Girl Clothes Line' Baby Shower Table Cover features pink chevron print and pink, purple, and white spots with tiny hearts. It even has an adorable motif of girls' baby clothes on a clothesline.